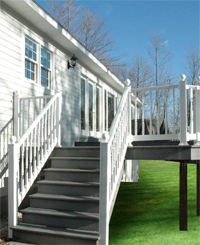 Shaum Construction is a small construction company that specializes in Eastern Upper Peninsula custom home construction services and remodeling. We believe that quality, knowledge, reliability and hard work are of no value without honesty and integrity. When, about 6 years ago, we decided it was time to replace our old cabin with a new year-round structure, we contacted Shaum Construction. By that time, Jim Shaum had retired. His son-in-law, Ken Hollinger had taken over the business. We were assured by Jim that Ken was well-trained and fully capable of any building needs we might have. We had a look at the quality of Ken's work and were quite pleased with what we saw. Ken worked with us initially in taking a general idea we had from Mike's parents' home and designed a home with a more open floor plan for the main living area. Ken and his crew and his subcontractors provided quality workmanship throughout the construction process from site preparation through building supplies, and electrical, plumbing, heating and cabinetry. Ken assisted us as needed with selection of materials such as flooring, window, doors, surface coverings, stone, etc. Of course, no building project of ours would be complete without modifications and add-ons as construction proceeded. Ken discussed these with us and made the adaptations where appropriate. Are we satisfied with the finished product? Absolutely. Would we recommend Shaum Construction? Without hesitation. 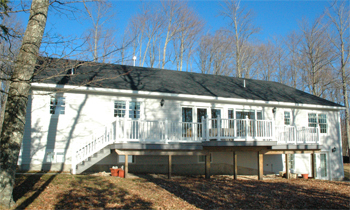 Shaum Construction provides a two year warranty on construction. We have to say that any little problem that came about was promptly dealt with. Ken Hollinger is easy to work with, honest, courteous, and prompt. He is up to date on building codes and building techniques. Also, if he feels something will not work, he is not afraid to discuss that fact. He is skilled at what he does. We were satisfied enough with the construction of our new home that last year Shaum Construction built a storage building for us. If you need a building constructed or remodeled, we would highly recommend that you consider Shaum Construction."